TN PRIME RIB: DIFFERENT....but it Works. Since I am a complete OPEN BOOK...............if you have read any of my previous blogs, you KNOW I LOVE to BLOG and I LOVE TO CAN. They are BOTH my STRESS RELIEF. And, sisters, if you will be honest, we ALL need a stress relief...............probably everyone does, but especially if you are in the ministry. We usually have a garden and some items I will purchase from local farmers and put up. This year we had NO GARDEN..............I came back from OBX and could not stand it because I had not canned anything. I LOVE to can vegetable soup............it is low in calories and great to take for lunch at school when it gets cold. Also....I can open it, add potatoes and some beef or chicken and have a quick meal for us. I have a recipe for three day sweet pickles that my Grandma passed on to my mom. Roger LOVES them with tuna fish. I usually make him a batch every three or sometimes four years. This was THE YEAR. We got home late on Thursday night and I got up Friday and went up on the mountain to the local farm. We went back again on Monday. I froze a 1/2 bushel of okra. Froze 4 dozen ears of corn.....some cut off and some whole. 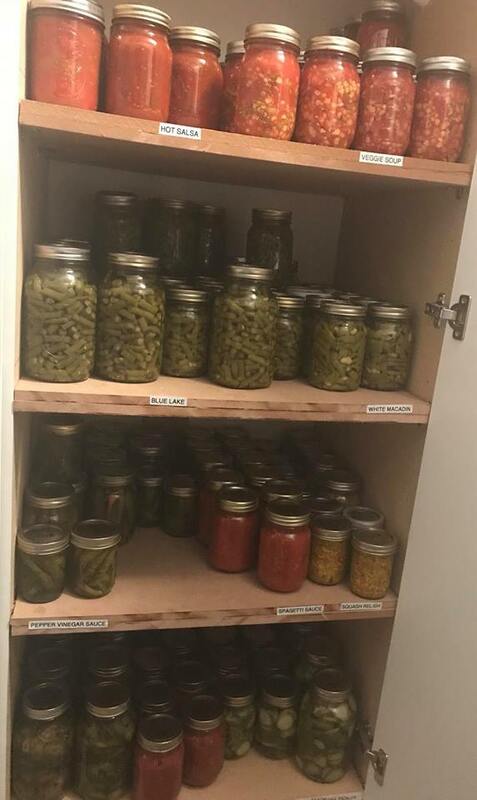 I canned 1 1/2 bushels of green beans. I made the three day sweet pickles for Roger. I made the old fashioned squash relish....which is great with dried beans, hotdogs, hamburgers, tuna and chicken. I canned two different batches of dill pickles. SOOOOOOO........if you ladies get hungry this winter, come to Dayton, TN and I will feed you. Smile. We did not have a garden, so this summer was different............but we will still have our homegrown veggies this winter. I share with my children and anyone else that wants it. Many times "the way we have always done it" CHANGES at church. Does that make it BAD? NO. It makes it DIFFERENT....but it Works. I still LOVE my own garden.................but Roger said in the end, it was cheaper to go up on the mountain and purchase the veggies wholesale from the farmers than it is to raise it ourselves. Regardless...............come on by..............I can hook you up with several things, including some of the three gallons of blueberries that are also frozen.